It’s the 4th of July this week, the most American of all holidays, so what better time to talk about pie? There are few things more American. Like the enthusiastic stoop-decorations of my Park Slope neighbours, different pies are appropriate for different seasons. In fall, it’s all about warm apple pies spiced with cinnamon, or nutmeggy pumpkin pies. Rhubarb pies herald the joyous arrival of spring, and cross paths with strawberries before summer really kicks in and brings pies stuffed with juicy berries, peaches, apricots, cherries and more. Summer pies always confused me a little. Fair enough in cold weather it’s fabulous to spend an hour rolling out pastry and then sitting by the stove, as the delicious aromas of pie fill the house with sugar, spice and everything nice. But in summer, who wants to be near an oven? And when the produce is so incredible – fragrant strawberries, tumbling punnets of blueberries, heavenly stonefruit, jewel-like cherries – why do anything to it? But this is America, where nothing cannot be improved with a dose of sugar and butter. So I’ve had about a year now of trying to make pies. I still have a lot to learn, but I’ve learned a lot. I’ve learned that I’m just not perfectionist enough to make immaculate pies, but I still believe that good ingredients, good intentions and enthusiasm can’t fail to produce something delicious… even if it is a bit lop-sided. When all else fails, invoke the word “rustic”. Never apologise for your cooking. It’s the “imperfections” that set a lovingly home-baked pie apart from a production-line dessert. I’ve also picked up a few tricks, all of which are common sense and probably common knowledge. But if you’re a beginner, I hope they help you put aside any trepidation you might feel about trying your hand at a pie. It’s a lot of fun, and once you have your basically pastry recipe down you can make up a pie with whatever fruit you have on hand. So here’s a strawberry-rhubarb pie I’ve come up with over the last couple of weeks, mashing together different recipes from online. I use a huge tart-pan from Ikea with a removable bottom, so I find one batch of this pastry isn’t enough to make a shell and full lid. Where once I would use half this amount of pastry for the shell, now I use about two-thirds, so it’s not stretched as thin – it’s made my pies so much better. Scroll down below the recipe and my “pie bible” of hard-won baking tips. Whisk together flour, sugar and salt. Cut cold butter into small cubes, then cut it into the dry ingredients – use your hands, a pastry cutter or a food processor if you have one – until a few pea-sized pieces of butter remain. Stir in the iced water gradually (you may not need all of it) and mix with a fork until the pastry just comes together. Gather it into a ball and wrap with plastic wrap or pop it in a ziplock bag to chill in the fridge for at least an hour. Wash, dry and cut the strawberries and rhubarb into fairly uniformly-sized pieces. Toss with the sugar, salt, cornstarch, lemon juice and liqueur (optional) and let it sit for at least 10 minutes. Roll out enough of your pastry (1/2 to 2/3) for the base of the pie, 3-4mm thick. Grease your pie tin (if it’s not non-stick) and press pastry gently into the corners and sides. Trim the edges, leaving some overhang if you plan to attach a lid. Beat an egg white and brush it over the pastry base to seal it from your juicy filling. Add fruit filling to pie, leaving out excess liquid. A couple of tablespoons of juice should be plenty. Dot the fruit with small pieces of butter, then add your lid/decorate the top. Set oven to 400 degrees, and allow the pie to chill in the freezer until the oven reaches full heat. When ready to bake, glaze the pie with a quick egg wash and sprinkle with sugar (optional). Bake at 400 degrees for 20 minutes, then reduce the heat to 375 and bake for another hour and 10 minutes. Keep an eye on your pie, and if the crust starts to look too brown, cover with foil. Allow pie to cool at least 3 hours before serving. You don’t have to be smooth… Lumps of butter in your pastry are actually a good thing. When your pastry is in the heat of the oven, those tiny nuggets of butter will melt, leaving air pockets – the key to flaky pastry. Most recipes will tell you to aim for pea-sized pieces. …But be cool. Because your pastry is mostly butter, when it gets warm it will start to fall apart. A hot kitchen, even just the warmth of your fingers while handling the dough, can make your pastry lose its cool. If it starts to feel sticky, or you notice the colour change a little (becoming more yellow) you’re in the danger zone. It can be a little stressful, especially when you’re doing something time consuming like shaping the crust or lid. But don’t lose your cool! You can easily take control by popping the whole thing back in the freezer to cool down, even just for a few minutes. You can do this as many times as you need to, even if it’s just to take a little break. Chilling your pie pan, even your rolling pin, in the freezer will help too. Roll with me. Keep your pie pan handy as you roll out your pastry base – you want to be sure that you have a bigger round of pastry than you need. Don’t forget your circle also has to go up the side of your pie tin, and you want some overhang too, to allow for sticking the top on. After lots of trial and error, I’ve found the best technique for rolling out pastry is to do it between two pieces of parchment paper, or at least on top of one piece. This saves you problems with the pastry sticking to your work surface, and allows you to easily move the pastry into your freezer if it needs some chill time. Dust your hands and rolling pin with flour when you need too, but be sparing. When you’ve got the right size and thickness, you simply flip over your parchment, pastry-side down in the pie tin, and gently peel back the paper. Plastic wrap or foil works for this purpose too. Seal the deal. With runny fillings like strawberry-rhubarb, leaky liquids risk making your pastry soggy. You can help prevent this by giving the inside of your pastry shell a quick coat of beaten egg-white (save the yolk for an egg-wash before the finished pie goes in the oven). Fill er up! You can pretty much play it by ear when it comes to filling your pie. Taste your fruit to get a sense of how much sugar you should add. You should add at least a little, to ensure the liquids released from the fruit during baking caramelise and thicken. A little flour or cornflower will also help set your filling – I’ve also heard of bakers using tapioca pearls for this purpose. Don’t forget a pinch of salt, any spices (cinnamon with apple, maybe nutmeg with peaches or apricots, cardamom could be fun) and don’t be scared to try a splash of liqueur. Toss your chopped fruit in a bowl with the sugar, salt, flour etc and let it sit a little while. You want to see some liquid released, but if you’re worried there’s too much juice you can pour some off before adding the filling to the pastry. The fun part. It’s time to get creative with the lid of your pie! If you want to do the classic double crust, make sure you roll out your lid with space to spare. Dot the filling with little pieces of butter before closing it up, use egg wash to “glue” pastry base to lid, and make sure you pierce some holes in the lid to allow steam to escape during cooking. If you work out how to scallop the edges, please teach me. If you want to try making a lattice top, it’s probably going to be easier than you think! Cut your strips a little bigger than you need and let them keep cool in the freezer while you look up some tutorials about how to weave the lattice. Your pie decoration is limited only by your imagination. Try using cookie cutters to make cut-out shapes dotted across the top, or scallop rounds of pastry like this amazing pie. You don’t even necessarily need a pie tin – try making a freeform galette, with a large round of pastry on a flat baking sheet, folding and pinching the edges in to make a rustic crust. Gorgeous. …Chill! While you preheat your oven, let your completed pie relax in the freezer. It will set everything nicely and help the pie keep its shape when it hits the oven. Last minute tricks. Just before you pop your pie in the oven, cut some tiny pieces of butter and dot them around the top of the pie. (If you’ve done a full lid, you would need to do this before adding the lid!) Brush the top with an egg wash – one egg or even just an egg yolk, beaten with a little splash of water. This will help your pastry turn beautifully golden. And if you want, sprinkle some coarse sugar (eg demerara, turbinado, raw sugar) over the top for a little sweet sparkle. Again, be cool. 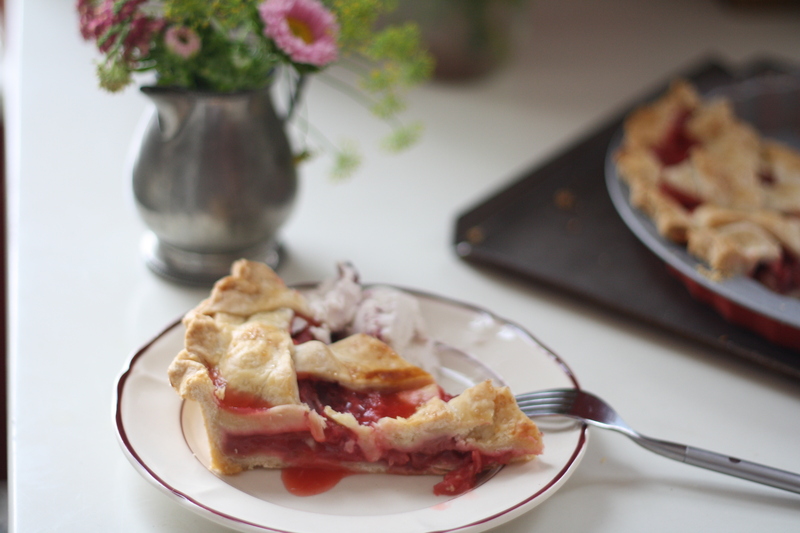 Some pies are perfect hot (apple), others need to cool to room temperature for best results (strawberry rhubarb). Either way, it needs at least a little rest outside the oven before serving, so the filling can see sure you can hear it bubbling. It’s a good idea to set your pie tin on a baking sheet too, in case of any overflow. If your pastry looks like it might get too dark, make a little tent of aluminium foil over the top and edges. t at least a little (and so no one burns their tongue). Why do you think there were always pies cooling on window sills in old cartoons? You gotta wait! Make sure you allow time for your pie to cool – some are even better made the day before you want to serve.